Newborn, 3 months, 6 months, 12 months & 18 months!!! 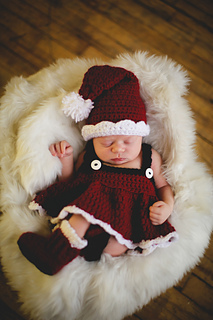 This ADORABLE Santa Set will be the hit of the day or the cutest Photography Prop your shop has ever seen! You receive BOTH BOY AND GIRL in one pattern download! Pattern includes 32 instructional pages! Pattern includes instructions for BOTH baby BOY AND GIRL, so you receive FIVE complete pattern sets in (5) different sizes. Pattern uses worsted weight yarn. The set has (3) three pieces for each size, Boy Hat, Booties and Santa Shorts AND Girl Hat, Booties and Santa Skirt with suspenders. You must be familiar with basic crochet stitches and techniques. My instructions are very well written and very easy to follow! Each pattern size is written out in full to allow you to print only one size at a time. That makes the pattern easier to read!